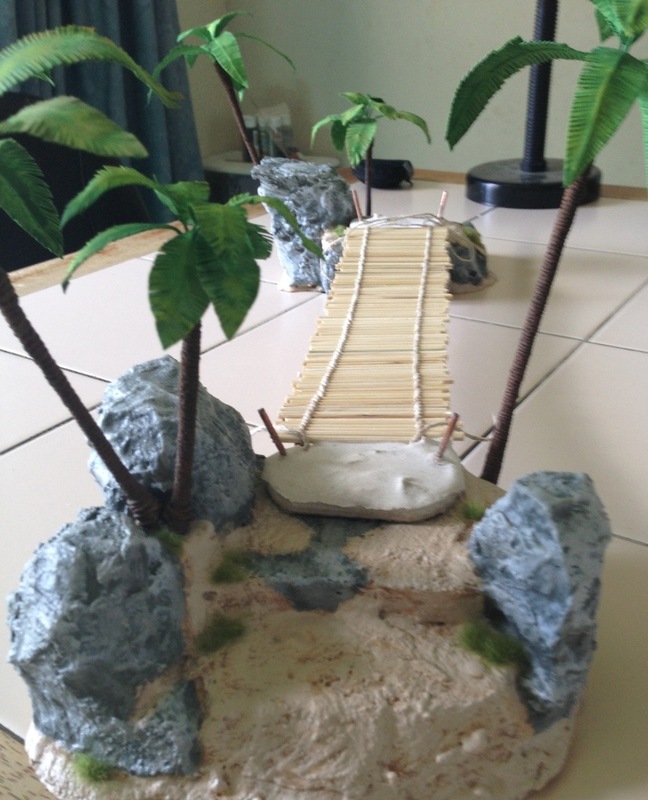 Still working on the bridge… Well, the landings actually. See previous work here. I attached the 2×4 lumber to MDF bases. Next I shaped some foam with my trusty foam cutter and glued that around the lumber. 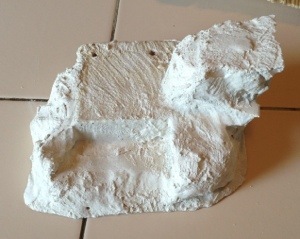 After the glue had dried, I attacked the bases with copious amounts of FoamCoat to shape the landing and rocks. I did discover at this point that FoamCoat does not stick well to rough lumber. 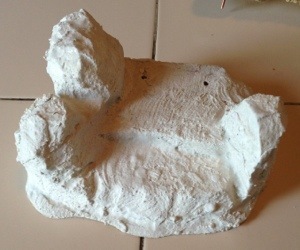 Sooo… I reinforced the FoamCoat with some PVA glue. Allowing the landings to dry overnight and reaching a day off from work, I started in to painting. 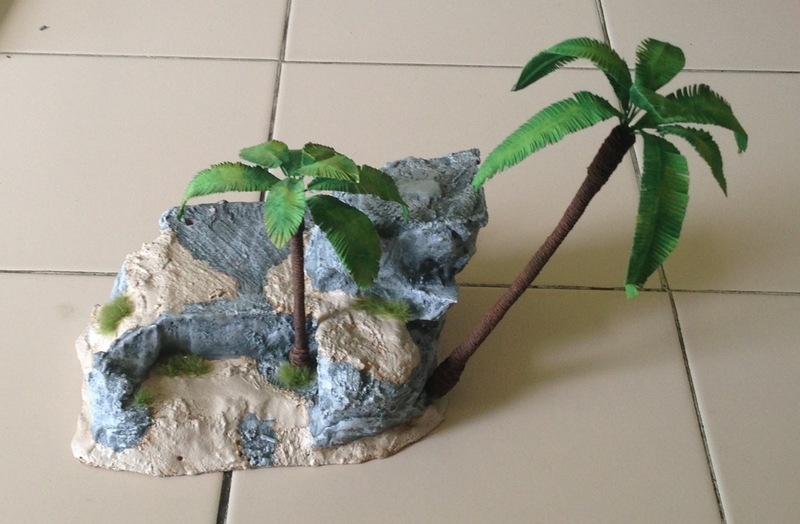 I use craft paints for the terrain pieces as it is quite cheap. 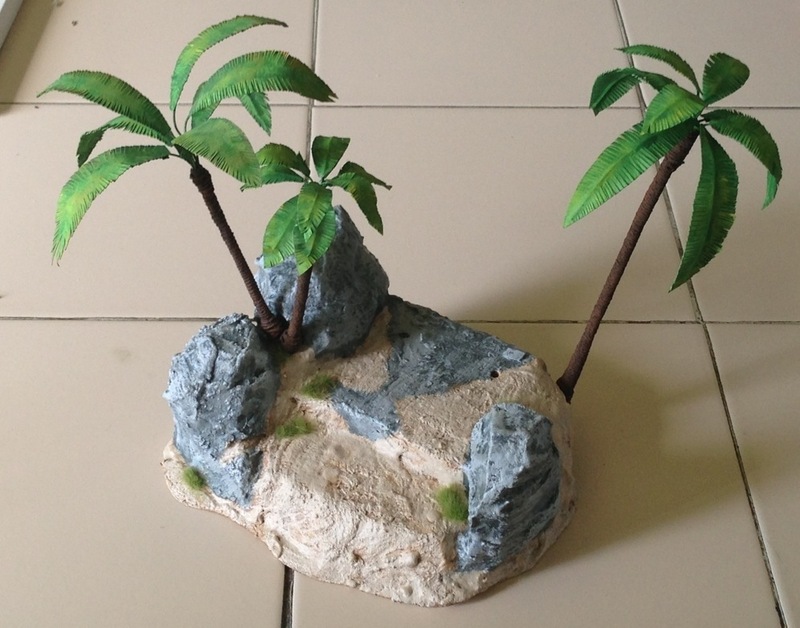 I drilled some holes and planted a few palm trees (made from wire, adhesive labels and string) and glued down some tufts of grass from Army Painter. A couple coats of matte spray and… Done! With the landings anyway. I still need to finish the rope anchors and hand lines and more paint, but for now, she is coming along nicely. Awesome. I’m going to have to put formcoat over my terrain. 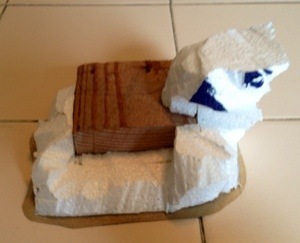 I use blue insulation foam for my hills, rocks, stone buildings, etc. Eventually the paint chips or it gets damaged. Thanks for the post! I like FoamCoat. You can control the texture (smooth vs rough) by varying the consistency of the mix. It seems to hold on to the foam very well. Wood? Not so much. It also adds some weight to the piece which I like as well. The blue foam is better for carving texture and detail into it. 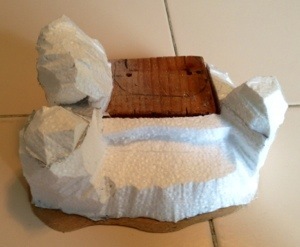 I have quite a bit of plain white styrofoam so that’s what I use. I suspect any carving or detail work may be lost under a layer of FoamCoat though. Feel free to borrow. Let me know what you come up with. I’m always looking for ideas to borrow myself. Preaching to the choir. Time is the rarest component in most of my projects.